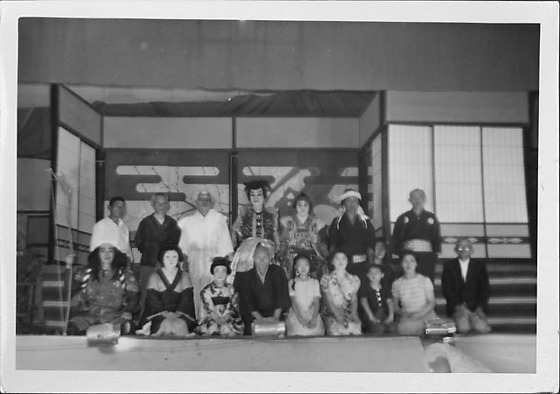 Blurred group portrait of seventeen men, women and children of Kabuki cast on stage at Rohwer concentration camp, Rohwer, Arkansas, November 12, 1944. Nine men, women and children kneel in the front row, several in costume including man holding bow and arrows at far left. Seven costumed men stand in back row with one woman kneeling at right. Three metallic footlights in foreground at edge of stage. Screens replicating interior of Japanese dwelling in background, including blossoming tree branches and stylized clouds on fusuma. Another figure is partially visible below the stage at BR. Stamped in black ink on back: NOV 12 1944.